The Korean tradition of deep-sea diving for fresh seafood dates back to the 5 th century. Initially, males dominated this profession. However by the 18 th century, women divers, also known as Haenyeo (해녀) or “ sea women ” gradually became associated with this tradition. In November 2016, the Haenyo from Jeju Island, South Korea were inscribed in UNESCO’s Intangible Cultural Heritage list. The Haenyo are best known as the female divers from Jeju Island. Without proper equipment, they dive into waters twenty meters deep to catch fresh seafood from the depths of the ocean. Equipped with only a lead-weighted vest and goggles, this women make dozens of dives a day while holding their breath for slightly more than three minutes at a time. Diving as a Haenyeo is no mean feat – for the work is often backbreaking and dangerous. Due to the grueling nature of the work, the Sea Women portray a rich tradition that is slowly being eroded. Through mastering the craft over the years, many of them have replaced their husbands as the breadwinner of the household. generation of this Korean culture “, Jose Jeuland shared. The most powerful imagery from the series are that of the close-up shots of their faces framed by goggles, wrinkled from being battered by the stormy waves and having weathered various hardships across the years. Through this series of photographs, Jose Jeuland hopes to share with others the values of dedication, grit and resilience in the face of adversity that the Haenyeo have come to represent. Limited Edition, delivered with a certificate of authencity and signed by the photographer Jose Jeuland. 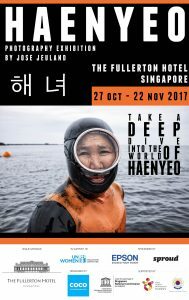 Jose did an international photography exhibition in 27 October to 22 November 2017 to showcase his photography journey about the female divers. Jose’s work about this subject matter has been published in various online and offline media, and has garnered strong interests from many organisations. Making Singapore the first country in his international photography exhibition, Jose would bring the exhibition viewers into his world of storytelling and inspire the next generation of culture vultures. The Fullerton Hotel Singapore, an organisation that has consistently shown strong support for the arts, is proud to be the venue sponsor for Jose’s photography exhibition. The exhibition will be organized by COCO PR & Communications Singapore. For more informations and access to the page here is the link.